Posted on September 23, 2006 by Ching under Flickr. 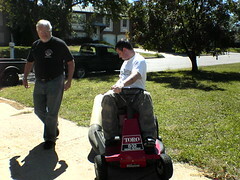 So Brian and his dad worked on the lawnmower today. I’m not sure what was wrong with it, but whatever it was it is fixed now. Let me just share some of today’s funniest moments. BRIAN (asking his dad): How much oil should I put in this thing? DAVE: What does the dipstick say? CHING (referring to Brian): The dipstick has no clue. DAVE: See how much of a difference using the right tool makes? Look at all that leverage. CHING: So it’s better to use the right tool and not be a tool. BRIAN: Wow. I’ve been promoted from a dipstick to a tool. DAVE: At least a tool is useful. As opposed to being greasy and just hanging around. CHING: That describes Brian to a tee! BRIAN: That’s it! You’re stleeping on the couch tonight! It’s so much fun to pick on Brian. I love you, baby!